Picture 1. A torch uses a simple circuit with a lamp, a battery, a switch and some wires. You can switch the lamp on by pressing the switch. 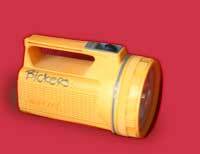 You can put a light on at the flick of a switch - either in a torch or using mains electricity. In both cases, the light is part of an electric circuit. In this electronic resource (e-source), you can find out about simple circuits (like a torch) as well as more involved circuits with more than one light. Each page has at least one circuit challenge. This allows you to build your own circuit to solve a problem. You can also try all the circuits together by clicking on the button at the top of the page. To build these circuits, you will need the latest version of the Flash plug-in for your browser. This is available from the Macromedia website.